She’s Really Friendly: Just don’t provoke her (Photo: Tim Murphy).New Salem, North Dakota—North Dakota never gets no respect. Even the friends we stayed with in Fargo came up empty when we asked for suggestions on what to do on our drive through the state. South Dakota at least has Rushmore and the Badlands; North Dakota has two cities(ish) on the Minnesota border, and some nuclear silos, if you’re into that kind of thing. Even our road map from the state tourism board was running out of suggestions by the time we got to Bismarck. But if you want to blame someone for the state’s emptiness, don’t blame North Dakota—blame the United States Senate, which brilliantly decided to split the relatively empty Dakota territory into two relatively empty states for political reasons. Anyways, to compensate for its lack of destinations, North Dakotans have, I think, informally embarked on an elaborate mission to construct the largest sculpture of every animal found on the northern plains. 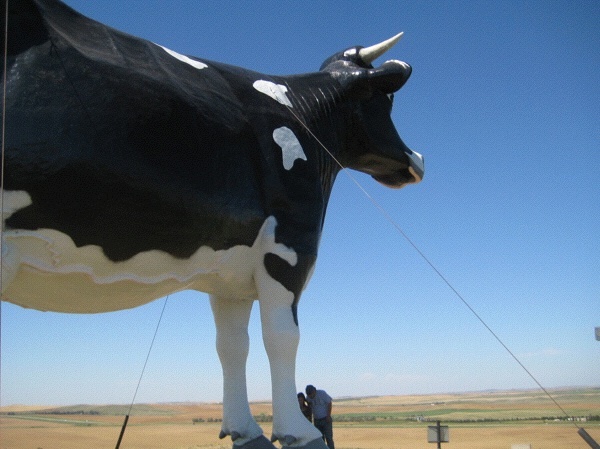 Before we found “New Salem Sue,” the world’s largest Holstein cow at 38×50 feet, we passed signs for, among others, the world’s largest sandhill crane, and the world’s largest turtle. It’s like Noah’s Ark on HGH. And while I’m not suggesting any sort of cause-and-effect, I should also note that North Dakota’s the last great place in America to find a job. So it’s got that going for it.